Have I ever mentioned that I’ve been in a lot of weddings? Probably not as I tend to avoid the topic of weddings in general. But I have. This weekend marks the fifth wedding I’ve been in and I’m going to be in two more this year. I either a) have a lot of really good friends, b) am a terrific bridesmaid, or c) don’t have the ability to say no. So yes, this weekend I embark on my journey to rival Katherine Heigl in the number of bridesmaids dresses I can collect. This weekend is packed full of wedding events, so don’t expect much from me until Monday. 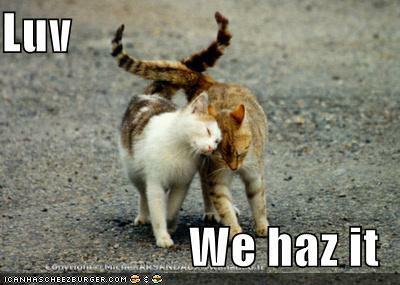 But I leave you with a wedding-themed lolcat, because, well, no short blog post is complete without a lolcat. I hear you on not being able to say no…it always seemed to me that if someone asks you do something that important you shouldn’t say no unless there is a very compelling reason. Others disagree, though, I’m sure. I can’t believe how many times you’ve been a bridesmaid! I have actually never been one. Ok, so I have to ask. As a bride, I hear you talk about your bridesmaid duties and dressing shopping and I almost recoil in horror. To me, it sounds more of you complaining about how many weddings you are in/have this year rather than genuinely happy for this moment in their lives…. and, again, as a bride, my heart drops hearing you talk about it that way. Do the brides whose weddings you’re going to be in read this? I just wonder if they somehow feel less than special for it 🙁 Perhaps learning to say no would make the day more special for everyone? Yes, the three girls whose weddings I’m in this year do read this blog, and two of them are super close friends of mine. I wouldn’t miss there weddings or being part of them for anything. And I am genuinely happy for all three of the girls who are getting married this year, just as I’m genuinely happy for the two girls I know getting married next year. It IS exhausting though. Anyone who’s been a bridesmaid in more than one wedding in less than 6 months can tell you that. Especially when at least one of the weddings is large and requires your attendance at a lot of different events and parties. It also can get very expensive very fast. Because it’s not just the dress, it’s the shoes, the nails, the hair, the travel, the gifts, the parties, etc. Not every bride is very considerate of her bridesmaids and their pocketbooks. Some brides are…just not all. I consider myself incredibly blessed to have so many friends who want me to be part of their day. There are very few people who I would say no to if they asked, because I consider it an honor to be a bridesmaid. You could make business cards: “Elizabeth, Professional Bridesmaid” and then have those typical wedding pictures/symbols all over it. Be sure to print on fancy-dancy invitation paper. Preferably with a pattern.